For our interesting offers and low pricesFor our yachts which are very well equipped and maintained to the highest standards of reliability, safety, and appearance.For our experience as a yacht charter companyFor the security/insurance we offer. Your sailing vacations can be secured/insured through UNIQA, Austria. Discovery Yachting faces No financial economical danger of any kind.For our efforts offering high quality services (provisioning, welcome packages, custom solutions, personalized services etc. )For the eagerness and competence of our staff. Bareboat charter is the private chartering of a yacht without hiring a Skipper. The charterers need the appropriate qualifications, as they navigate and handle the yacht. According to the Greek law and port authorities, to charter a bareboat yacht in Greece, it is required for two members of the crew to have sailing experience and abilities to sail and navigate the yacht, and at least one of them to have a sailing certificate officially authorized to his/her country (Skipper). If the second member (co-Skipper) has no sailing certificate of any kind, it is required to fill in an official statement declaration for his/her sailing ability and experience. This official statement will be normally filled prior embarkation. Skippered/crewed yacht charter is the private chartering of a yacht offered with a Skipper for Skippered charters, or with crew (skipper and hostess/cook) for crew charters. These charters are recommended for people who are not qualified and do not fulfill the above bareboat criteria, or for those who do not have enough experience to handle a yacht themselves. A local skipper is necessary if you do not fulfill the above bareboat criteria. Still, it is common for guests to hire a local skipper just because they want to avoid the captain’s duties on board, make the cruise more relaxing, benefit from the skipper’s local knowledge and sail straight to famous destinations or discover hidden places. Skipper’s fee is approx. 140 Euros/day, regardless of the number of people on board or the yacht size selected. The skipper is usually sleeping in his own cabin, and his main job is to navigate, moor and look after the yacht and the crew giving priority to safety. Please have in mind that in addition to the skipper a second crew member (a cook or a hostess/ steward) can take care of breakfasts and meals. The inventory list is a detailed list which includes all items and equipment on board. Planning your sailing holidays in Greece and Greek islands couldn't be easier. 1. The easiest way to make an initial inquiry regarding a bareboat yacht charter, or a crewed/Skippered yacht charter, is by sending us an inquiry formWhat’s next? 2.Within 24 hours upon receiving your inquiry form, we will send you complete and detailed offers, with a variety of available yachts meeting your requirements and needs for your sailing holidays in Greece and Greek islands. You can also explore our website to find yacht information with photos, specifications and layouts, and if you find a specific yacht of your preference, you can ask for availability. We also suggest that you visit our Special offers as well as our Destinations pages, where you can find suggested itineraries and information about the Greek islands. 3.As soon as you agree with one of our offers, then you will be requested to send us your details (address, tel. number etc. ), sailing certificates for skipper and co-skipper (According to the Greek law and port authorities, to charter a bareboat yacht in Greece, it is required for two members of the crew to have sailing experience and abilities to sail and navigate the yacht, and at least one of them to have a sailing certificate officially authorized to his/her country (Skipper). If the second member (co-Skipper) has no sailing certificate of any kind, it is required to fill in an official statement declaration for his/her sailing ability and experience. This official statement will be normally filled prior embarkation. ), Passport or ID details/copies, so that we can issue your charter contract and send it by email, for you to sign and send it back to us by email. If you prefer this paperwork to be done by post mail this is possible as well. Your charter contract will include in detail, the charter yacht, the exact dates, the Base port and the total price. No extra charges will arise during your charter. If you order any additional extras (options), you will formerly be informed of their price, which will also be stated in the contract.Feeling better if insured? 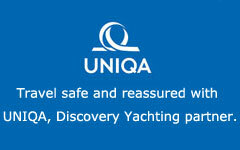 Travel safe with UNIQA, Discovery Yachting partner. Please don't hesitate to ask information regarding Charter security deposit insurance, Charter cancellation insurance and Charter payment protection insurance through UNIQUA, Austria. 5.Two weeks or earlier prior to embarkation, you should send us your crew list, copies of skipper’s sailing license credentials, co-skipper’s sailing license credentials or co-skipper’s official declaration statement and your arrival details. Also please don’t hesitate to contact us if you need any further arrangements from Discovery Yachting such as provisioning, transportation from the airport, hotel reservation etc. 6.Finally getting closer to the embarkation date you will receive your Boarding pass with Base information, details for the contact person, yacht location, etc. and you will be ready to experience the famous amazing sailing vacations in Greece and Greek islands. Discovery Yachting provides yachts with full safety equipment according to the Greek law. This equipment such as fire extinguishers, life rafts, safety belts, life jackets, flares, EPIRB etc. are carefully inspected every year and renewed. Furthermore onboard you will find Greek seas charts and Greek Waters Pilot book (in English). If you decide to book early enough, this will give you the advantage to choose among a greater selection of yachts and dates than later or last minute. However even at last minute please check our Special offers and maybe you will find an interesting one. All charters normally begin on Saturdays and end on Saturdays. Embarkation/check-in begin at 17:00h on the starting day (Saturday) and disembarkation/check-out at 09:00h on the ending day (Saturday).When your yacht is ready, sometimes before 17:00h, (if you definitely want to check-in earlier please check our optional prestige pack in our pricelist), the skipper and the co-skipper together with a qualified member of Discovery Yachting will start the check-in procedure. After that, follows the briefing for the skipper and co-skipper giving useful information (safety, navigation etc.) and instructions about the yacht for a safe and amazing voyage. The skipper and co-skipper must always inform their crew about the yacht’s safety equipment (life raft, lifejackets, EPIRB, fire extinguishers, flares etc.) and where are placed.Finally the charterer (skipper) of the yacht has to sign the inventory list upon embarkation, after having checked the equipment of the yacht.Regarding Disembarkation/check-out, the yacht must be in the port of disembarkation the latest by 18:00h on the previous day of the end date of the charter (normally Friday evening), and the reason for this is to have sufficient time to inspect and repair the yacht in case of any damage before the next charter. This way, we ensure that our yachts are in perfect condition for the next charter. Also by this, the risk of having yachts returning late for check out due to unforeseen circumstances is minimized.Check out starts at 09:00h in the morning of the ending day and not later, in order to prepare the yacht for the next charter. At the end of each charter a hull and steering system check is carried out by diver.During check out, only the skipper and a qualified member of Discovery Yachting should be on the yacht in order to check the yacht easily. All other passengers/guests together with their luggage should be out of the yacht.After check out, the charterer completes a review form. Your opinion is appreciated and helps us improve our services. All yachts are insured, including third Party cover meaning that in case of any unfortunate damages or losses to the yacht and/or her equipment our insurance company will pay for repairs that cost more than this security deposit which is the deductible amount (as an example: if a yacht has a security deposit of 2000 Euros, the insurance company will pay for damages that cost more than this amount of 2000 Euro).Each charter crew leaves a Refundable Security Deposit which is held against the yacht's insurance and if there is no damage or loss to the yacht or its equipment, this amount is fully returned to the charterer. In case of any damage or loss, the cost of the parts or repair is estimated and deducted. The balance is refunded to the charterer.NOTE: The security deposit does not cover fuel and water consumption, end-cleaning expenses, Port fees of the itinerary, second linen and towels set per person, transfers, provisions (can be arranged by sending a list at least one week before embarkation), Flight tickets, Ferry tickets, Hotel accommodation and any optional extras such as Skipper, Hostess, Spinnaker, blister, prestige pack etc., delay of re-delivery of the yacht and any results of gross negligence.When you sail with Discovery Yachting you can have security deposit insurance through UNIQA, Austria. Charter price includes the yacht rental fees for the period and ports agreed and its inventory equipment, Taxes, Yacht’s insurance, Port-marina fees at base port (embarkation/disembarkation), Linen, towels, blankets (one set/person), Dinghy and optional outboard engine, GPS plotter, VHF, Electric windlass, Autopilot (when applicable), Bow thruster(when applicable), Webasto heating (when applicable), cooking gas, water filling in base port, Fuel for the dinghy’s outboard engine. Charter price does not include the refundable guaranty security deposit, yacht’s fuel consumption (the yacht must be delivered filled up with fuel as it was on the starting date), Water consumption, Compulsory extras (end cleaning etc.) as described in our pricelist and it will be stated in the contract, Port fees of the itinerary except from embarkation/disembarkation, second linen and towels set per person, transfers, provisions (can be arranged by sending a list at least one week before embarkation), Flight tickets, Ferry tickets, Hotel accommodation and any optional extras such as Skipper, Hostess, Spinnaker, blister, prestige pack etc.Discovery Yachting guarantees that the total charter price will be officially stated on your contract and No extra charges will arise during your charter. If you order any additional extras (options), you will formerly be informed of their price, which will also be stated in the contract. In the event of yacht charter cancellation, the following cancellation fees apply:Cancellations made 90 days or more prior to embarkation 350 euros will be retained.Cancellations made between 89 & 60 days prior to embarkation, 30% of the total charter price will be retained.Cancellations made 59 days or less prior to embarkation, 100% of the total charter price will be retained.Please have in mind that you can select charter cancellation insurance through UNIQA, Discovery yachting partner.Discovery Yachting reserves the right to refund or not the charterer cancellation fees and only if succeeds in chartering the Yacht to another Charterer for the same period and under the same conditions. In the event that the Charterer should decide to end the charter and deliver the Yacht prior to the agreed ending date as in contract, the company shall not be liable for returning of any proportional part of the charter price amount. We will be the first to call in such an event. Through the years, we have developed a network of trusted associates and technicians all around Greece and this network will be at your disposal for any problem you may face. It is customary and at your discretion to tip the staff or the crew a gratuity tip, if you were satisfied by the service you received. How much, is up to you. However our experience is such that we know for a fact you will meet the staff and crew as strangers but you will part as friends because of the Greek hospitality spirit that drives these hard working professionals to go above and beyond the call of duty to satisfy the client who they consider their guest, you! Nausea, depends on you and your past experience. If you worry about it, there is certain medication available (travel gums, bracelets, pills etc.). Also, Discovery Yachting can recommend as much as possible calm water itineraries, sailing in protected areas (of course this depends also on the weather), so as to avoid extreme conditions. Normally, pets are not allowed on board yachts, so that cleanliness is maintained to the highest standards and for not damaging or scratching the yacht. Pets can be even more sensitive than humans and longer cruises can be very uncomfortable for them. However, we will be at your disposal for any discussion on this.